An unexpected surge in flu cases across the nation has prompted health authorities in South Australia to begin early distribution of free vaccines in an effort to curb the spread. There have been more than 26,000 confirmed influenza cases since the start of 2019, which is significantly higher than previous years. New South Wales and Queensland have both had more than 7,000 since the beginning of January. But South Australia is leading the per capita trend, with almost 4,485 cases compared to 1,139 at the same time last year. “Normally it’s relatively quiet at this time of year for influenza, so this is a somewhat exceptional year,” World Health Organisation flu specialist Professor Ian Barr said. Distribution of the free vaccine for people aged 65 years and older has already started in South Australia, while distribution for children under five and all other eligible groups started on Monday. “The winter demand management strategy — I’ve never heard of it being released before Easter,” SA Health Minister Stephen Wade said. More than 1,000 influenza cases have been reported in South Australia in the past week alone. “While it’s not possible to predict the severity of a flu season, it’s important the community remains vigilant,” SA Health disease control expert Dr Louise Flood said. For many sufferers, the flu causes moderate symptoms that ease after a few days, but for others it can lead to severe illness and sometimes even be fatal. A young child died in Victoria last month due to what health authorities have labelled one of the biggest summer outbreaks of flu the state had seen. During January and February there were also seven deaths reported to NSW Health — all associated with influenza outbreaks at aged care facilities. “We’ve had one death so far this year … and we’ve had 12 outbreaks in aged care facilities,” Dr Flood said about the situation in South Australia. Dt Flood said people with existing medical conditions and Indigenous Australians are also considered at higher risk. The federal Health Department said vaccines would be made available through the National Immunisation Program from mid-April, “subject to local distribution arrangements”. Immunisation Coalition chairman Professor Robert Booy, who is a researcher at the University of Sydney, said several states had begun rolling out their own vaccination programs. “New South Wales has also been releasing free vaccination in recent weeks, so they too are doing it early,” he said. 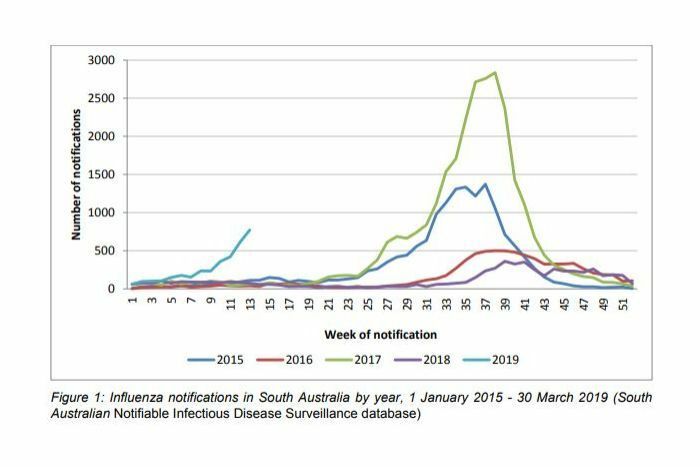 “I’ve been following influenza in Australia for 15 years and I’ve never seen an early onset like this before. Distribution of free vaccines to GPs and others providers is also currently underway in Victoria, while authorities in Queensland have also begun urging locals to get vaccinated. Professor Booy said the early surge in cases began in the tropics at the start of summer, and may be being driven by global trends and tourism. “It’s gone all the way down the east coast of Australia and the numbers have continued to increase for the past three months,” he said. “We can only conclude that we’re getting a lot of infection back from overseas.